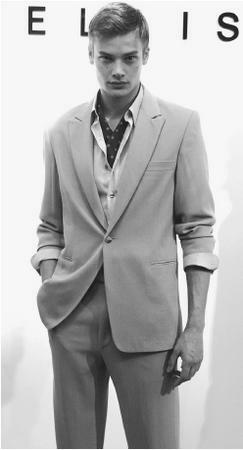 Perry Ellis, spring 2001 collection: wool/viscose crepe jacket and pants with a cotton dress shirt. president/designer, Perry Ellis Sportswear, Inc., 1978-86; Perry Ellis International menswear line launched, 1980; Portfolio label, lower priced sportswear revived, 1984; fragrance collection launched, 1985; company went public, 1993; womenswear discontinued, 1993; Perry Ellis America for men line introduced, 1996; announced new bridge line, 1998; firm acquired by Supreme International, 1999; reintroduced womenswear, 2000; discontinued women's sportswear, 2001; acquired Bugle Boy, 2001. Exhibitions: Fashion Institute of Technology, 2000. Awards: Coty American Fashion Critics award, 1979, 1980, 1981, 1983, 1984; Neiman Marcus award, Dallas, 1979; Council of Fashion Designers of America award, 1981, 1982, 1983; Cutty Sark award, 1983, 1984; Council of Fashion Designers of America Perry Ellis award established in memoriam, 1986; California Men's Apparel Guild Hall of Fame award, 1993. Died: 30 May 1986, in New York City. Company Address: 575 Seventh Avenue, New York, New York 10018, USA. Company Website: www.perry-ellis.com . Moor, Johnathan, Perry Ellis, New York, 1988. 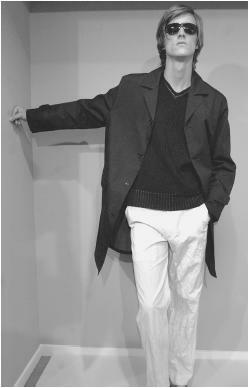 Perry Ellis, spring 2001 collection: cotton double-faced top coat, cotton ribbed sweater and wrinkled cotton flat front pants. Morrisoe, Patricia, "The Death and Life of Perry Ellis," in New York, 11 August 1986. Fressola, Peter, "Perry Ellis," in DNR, 13 April 1987. Parola, Robert, "At Ellis: Discord on Design and Direction," in DNR, 24 July 1992. Larson, Soren, "Parlux Set to Chase American Dream," in WWD, 2February 1996. Williams, Stan, "Perry's Parry," in DNR, 31 January 1997. ——, "Keeping Perry's Image Positive," in WWD, 23 February 1998. Lohrer, Robert, "Supreme to Acquire Perry Ellis," in WWD, 29January 1999. D'Innocenzio, Anne, "A Perry Ellis Revival," in WWD, 23 December 1999. "In Miami, Perry Ellis Reigns Supreme," in DNR, 4 February 2000. "Perry Ellis to Acquire Bugle Boy," in WWD, 9 February 2001. Wilson, Eric, and Antonia Sardone, "After One Season, Perry Ellis Yanks Women's Sportswear Line," in WWD, 6 April 2001. The house of Perry Ellis has seen more than its share of tumultuous times. From the early days things had never been particularly easy, with Ellis continuously battling over finances with his parent company, Manhattan Industries. Problems with stability continued after Ellis' death in 1986, when Robert McDonald assumed the helm of Perry Ellis International, only to die four years later. Then came Salant's $100-million takeover of Manhattan Industries and its subsequent bankruptcy filing. Obstacles with direction, especially within the menswear divisions, to the disjointed running of Perry Ellis International (PEI) in the mid-1990s, continued the company's disarray. After several top management changes, PEI finally seemed to stabilize, and once again received notice for the fashions bearing the Ellis label, including the launch of a new bridge line for 1999. Yet before plans were finalized on the bridge line, Salant went bankrupt again, and Supreme International came forward to buy the beleaguered Ellis kingdom. Supreme then took the Ellis moniker, establishing the Perry Ellis International Corporation. Perry Ellis was known as a flirtatious, fun-loving man with a great sense of humor. According to Claudia Thomas, former chair of Perry Ellis International, it is hard to characterize Ellis, except to describe him as whimsical. There was, however, an air of seriousness about him when it came to creating and fulfilling his objectives, as reflected in his personal philosophy of "never enough." Yet it was the playful side of his personality most reflected in his fashions. When his company arrived on the scene in the 1970s, it was a time of increasing emphasis on American designers and designer name merchandise. Ellis did his best to create a mystique about himself and his lifestyle that would attract fans. The Perry Ellis look began as a casual, relaxed style exclusively American in feeling and sportswear-like in its practicality. It was so playful and comfortable, in fact, models at his shows would skip down the catwalk. As Ellis matured as a designer, his clothing occasionally took on a more serious tone, but even his most formidable collections were considered easy-dressing by fashion industry standards. Inspiration came in many forms—California, artist Sonia Delaunay, movies or Broadway shows (like Chariots of Fire or Dream Girls — all retained the casual ease for which Americans are known internationally and the sense of proportion and freedom from fashion conformity which became the hallmark of Perry Ellis. The company's subsequent womenswear designer, Marc Jacobs, and menswear design director, Andrew Corrigan, appeared to create their collections with the feeling Ellis had tried to instill into a consumer's mind when buying clothing. Ellis once said, "Always provide the clothes needed for daily life. Never be afraid to take risks and, most importantly, never take the clothes you wear too seriously." Through all the transitions and the fickle nature of fashion, Perry Ellis menswear—and at times its womenswear—remained relatively consistent and true to the tenets and goals espoused by Ellis himself.